Lately I have been experimenting with many different ingredients. Trying to find out what flavors work together. So I went down to ICA one evening to get some onions. And of course ICA being… well ICA, didn’t have a single onion available. Folks, If your supermarket runs out of onions to sell then maybe it’s time to consider taking your shopping elsewhere. Instead they had this small, tiny, figgie things called “Shallots”. In the culinary world, you may come across ingredients that may somehow confuse you, the onion and the shallot for example. Many people don’t know the difference between the two as they often substitute one another. But what exactly do they do to the dimension of the dish. How distinctive are they from each other? Let’s find out! Let’s start with the one we all are familiar with, the onion. I love onions, I cannot think of any signature Asian dish perfected without onions. It often comes in different tastes and measures. It can be sharp, spicy, tangy and pungent or mild and sweet. It is such a versatile ingredient. Easy to grow, very tasty and good on budget. Hence the reason it’s used in the kitchen worldwide. Aside from the similarities to the onion, the shallot has it’s own flavor to add. Shallots are a lot smaller compared to the onions. Although it may resemble the taste of onion, it is far milder and sweeter in flavor. 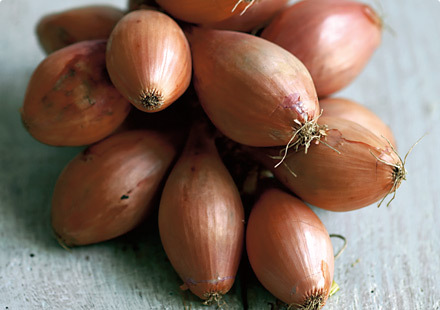 Distinctively from onions, shallot may taste with a hint of garlic. Not to mention it is in fact much easier to grow than it’s cousin the onion. They both make you tear equally though, runs in the family I guess. There are several things I take into consideration. Texture: if it is cooked & you want crunch use onion. Shallot, especially if it is finely minced can almost disappear, so its a good choice for a smooth sauce. Time of cooking: If you want the flavor to stand out during a short cook use onion, shallot will mellow faster and blend with the other flavors quickly. Raw: shallot can have a very sharp bite, onion usually not quite as sharp raw. Price: onion is usually less expensive. A lot is just your personal preference, so enjoy experimenting!